Bishop struggled at times to find the right tone in response to an inward-looking America and a muscular China. 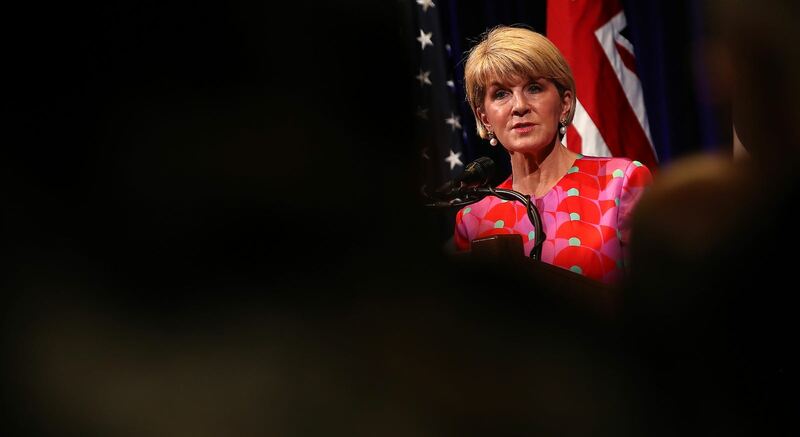 Few can quibble with the accolades that Julie Bishop has received in recent days for the manner in which she performed the role of Australian foreign minister. The first woman to hold the position, she graced the world stage with a mixture of professionalism and poise, dignity and discipline. No one can doubt Bishop’s ability to master a brief or effectively prosecute the national interest. Her legacy, of course, can only be fully debated with the passing of time and the release of the documents. But it will surely include her effective stewardship of Australia’s presidency of the UN Security Council, passionate championing of the New Colombo plan, and vigorous prosecution of the Australian case against Russia over its suspected involvement in the downing of the Malaysian airlines flight MH17. For a period last year there were needless rhetorical provocations of China, where Australian domestic political imperatives trumped diplomacy. As deputy leader of the Liberal Party for the time she served in the position, Bishop has also maintained effective working relationships with her two prime ministers: a crucial dimension in the making of Australian foreign policy, and one perhaps all too often underestimated. Thus, the period has not been characterised by the ructions which occasionally strained the Keating/Evans and Fraser/Peacock relationships: a net positive in such politically rancorous times. Her vital contribution to good governance in an era otherwise in thrall to chronic ad-hocery is no small achievement. There can be no doubt, however, that HV Evatt, Percy Spender and Richard Casey would turn in their graves hearing Malcolm Turnbull’s assessment last Friday that Bishop was this country’s “finest ever foreign minister”. Gareth Evans and Alexander Downer would also claim a niche in the pantheon. Valedictory press conferences are often excitable, but ultimately history will judge how the individual has dealt with the circumstances thrown into their path. Some analysts are already trying to glean from Bishop’s time in office a model for Australia’s future statecraft. In the case of how to approach China, Canberra hawks are slotting her into a prefabricated mould for how future foreign ministers should deal with the Middle Kingdom. The message? Here is how to stand up to the new regional bully. 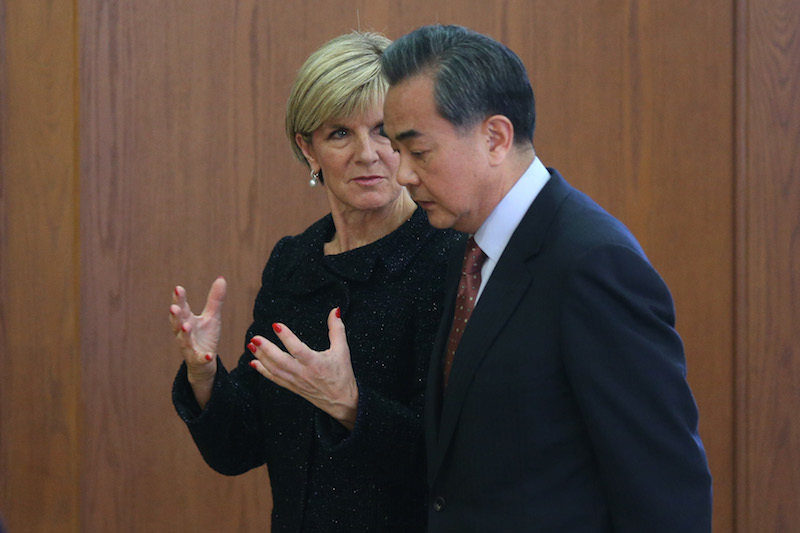 Rory Medcalf, for example, praised Bishop for “not compromising Australian interests and values under pressure from China” – no argument there – but also for “not being excessive in the way she has communicated Australian interests to China”. These instant judgments tend to put experience into a straitjacket and reduce the Australia-China relationship to a simple caricature. No one doubts the need for this country to appropriately defend its liberal democratic values in the face of egregious foreign interference, but the Australia-China relationship will continue to require an equal measure of subtlety and constructive dialogue, not to mention private and, when required, firm diplomacy. The foghorn is best put aside. Such an assessment either plays down or ignores, however, Bishop’s capacity for occasional rhetorical over-reach where Beijing is concerned. In her Fullerton lecture in Singapore last year she took a leaf from the American playbook by publicly lecturing the Chinese that only by embracing democracy could they realise their full economic potential. No Australian leader since diplomatic relations with China began in 1972 had ever seen fit to use a public speech to hammer that message. It was arguably the beginning of a cold snap in the relationship. By the end of the year, however, as the White House was calling out China as a revisionist power, the government’s White Paper assessed the risk of direct military threat to Australia as low. Bishop was more resolute than ever, too, that Australia would not do freedom of navigation patrols in the South China Sea, a point at odds with the recent statement by the US Embassy in Canberra that Australia is some kind of “poster child” for the Trump White House. This is by no means an easy period in which to navigate the way ahead for Australian foreign affairs. China policy – with its strategic, economic and cultural dimensions all pulling in different directions – is not an easy subject to grapple with. America under Trump is erratic, unpredictable and eschewing its own exceptionalism. No one minister, policy wonk or historian has the gift of seeing around these kinds of corners. Nevertheless, it might be said that Bishop’s role as foreign minister was also to try and set out some kind of narrative or conceptual framework for the country’s international role. The White Paper went some way to fulfilling that task, but at times one felt that the continual invocation of an “age of uncertainty” masked the need for hard thinking. Some of Bishop’s speeches were often prone to either grandiose pronouncements – such as her claim that ISIS presented a bigger threat to the West today than Soviet Communism in the Cold War – or glib recitals, only since 2014, of the need to preserve the “rules-based order”. There can be no question that this American created and led order worked well for Australia in terms of peace and prosperity since the Second World War, and a Foreign Minister is hardly going to talk it down. But the use of the term not only glides over moments of US strategic failure – what of Vietnam and Iraq, for example? – it too easily masks the real differences, as Graham Allison has recently shown, between the Cold War and post-Cold War orders. In short, the “rules-based order” that Bishop ceaselessly invoked was well and truly creaking before Trump came to office. Both Bishop and Turnbull struggled at times to get the tone right in facing these two headwinds – an inward-looking America and a muscular, aggressive China spreading its strategic wings in the region. They were reluctant to face up to the consequences of a changed America, believing Trump to be an aberration and proposing that the best Australia could do is ride out the storm until the return of the “indispensable nation”. And for a period last year there were needless rhetorical provocations of China, where Australian domestic political imperatives trumped diplomacy. 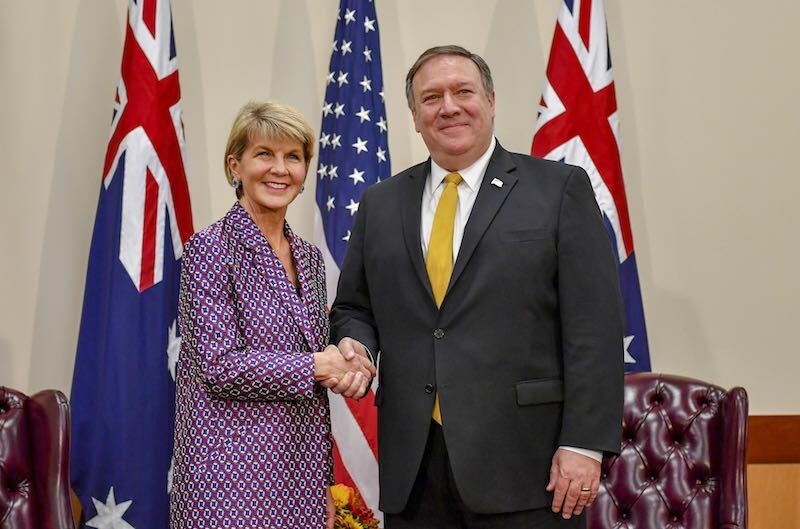 As America wrestles with its limitations and as China continues to plant a more aggressive regional tread, the job of Australian diplomacy becomes even harder than when Bishop took the helm. The refrain about riding two horses simultaneously surely needs to be tossed aside. And the new foreign minister and prime minister could reinforce to Australians the scale of the geostrategic transition they face and set about the complex task of harnessing both national purpose and policy to meet it.